1. 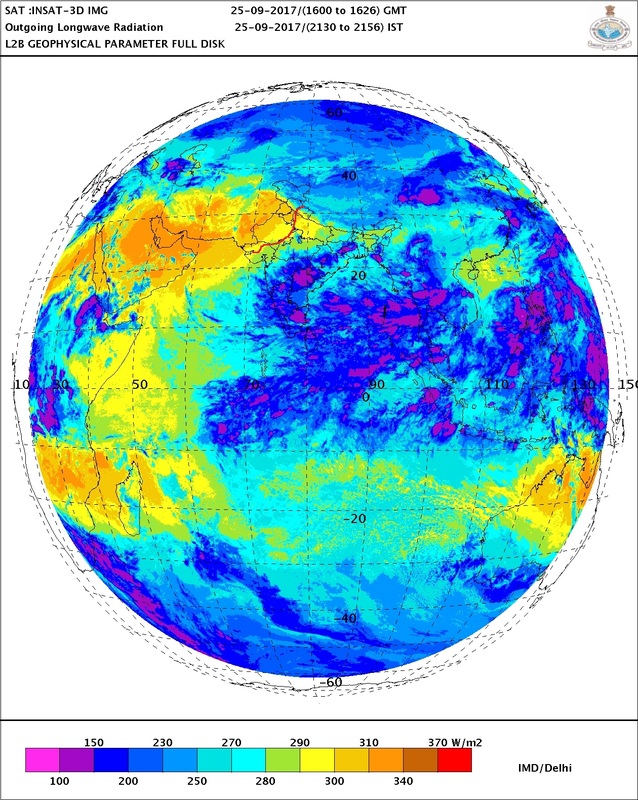 Anti Cyclone at 850 hp levels, OLR, UTH and dry air indicates the withdrawal of South West Monsoon from Rajasthan, Kutch, Punjab, Haryana, H.P. and Kashmir. Next phase indicates withdrawal from West M.P, Saurashtra, North Gujarat, Uttarakhand, Haryana and Delhi. (Next 2 days). Within 2/3 days, we will see strong dry NW winds blowing over Delhi. Monsoon withdrawal will commence from Vidharbh and North Madhya Mah. and Marathwada from 1st October. Mumbai City: Thursday: Morning will be cloudy with a shower in some areas. Clearing later by afternoon. Friday: A thunder shower likely towards the latter part of Friday. Saturday: Maybe a thunder shower in the evening, maybe the last wet weekend of the current season. Mumbai City can anticipate the first half of October to become hot...and mercury could even touch 38/39c ! Thundery conditions can develop in Interior North Konkan (Outer Townships) on Thursday/Friday. Pune: Pune experienced a medium fog on Monday morning. Next 3 days city may expect a thunder shower in late afternoon/evening, with Friday maybe getting a heavy shower in some areas. Kolkata: Thunder showers increasing after Wednesday on daily basis. The El Niño–Southern Oscillation (ENSO) is neutral. However, sea surface temperatures (SSTs) have cooled in the central to eastern tropical Pacific since mid-winter. These SSTs are currently cooler than average but within the neutral range. Waters beneath the surface are also slightly cooler than average. Other indicators of ENSO, such as the Southern Oscillation Index (SOI) and trade winds, also remain at neutral levels. All international climate models surveyed by the Bureau suggest further cooling of the tropical Pacific Ocean is likely. Five of the eight models suggest SSTs will cool to La Niña thresholds by December 2017, but only four maintain these values for long enough to be classified as a La Niña event. While unusual, it is not unheard of to see La Niña develop this late in the year—the Bureau will keep a close watch for further, or sustained, cooling of the equatorial Pacific. Of the late-developing La Niña events, their effect on summer rainfall has been mixed, with some leading to widespread wet conditions across eastern Australia, and others having minimal effect. The Indian Ocean Dipole (IOD) is neutral and the model consensus suggests it will remain so. 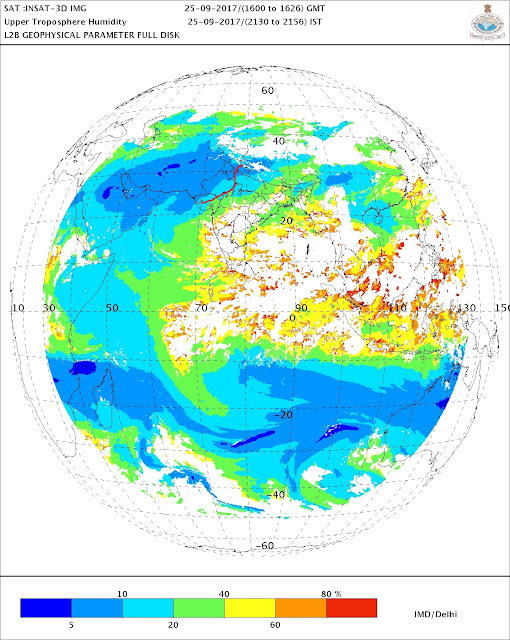 Three of the six climate models surveyed suggest positive IOD thresholds may be reached during spring, but it may now be too late to become an event. If a positive IOD eventuated it would be short-lived, as events typically decay by December. Thankyou to the vagaries team for keeping the followers updated on changes in weather all through the monsoon season. South india is looking for NEM and forthcoming winter for north india. Can we forecast as how the winter would be overall for india. Massive rains in bangalore last night. Post 12.30 am the rains started. The rains were widespread. But SOUTH Bangalore got more rains. My place at 125 cms for the year. Normal is 97 cms. Most area's of south bangalore are over 110 cms. A remarkable year this. 20% to 30% excess rains. Thank god for the gift. MYSORE district got very heavy rains last evening and night. Some places reporting over 150 mm. Wish I could share some snaps . Post very heavy rains bangalore looks to be floating in clouds this morning. Its misty , wet and cold. Feel sun will be out only after 11 am. Good to hear about bangalore and south india getting much needed rains this year. KRS may reach 30 TMC very soon, Much needed rain in bangalore.., More rain to come in this week..
@ Vijayanand. Nice to here. Blore is on ride this Aug/Sep ! As highest Aug-Sep total in history this year. And last year's Aug-Sep-Oct total was lowest in history. So exact opposite events in 2 years..
And Vijayanand you can share ur pics via Vagaries of the Weather FB group.. If yourself on FB, then please join the group. Thanks.Yes true Abhijit..can post picture on FB. Tomorrow one day cricket match in bangalore. Hope it does not get affected. With all these rains not sure what state the pitch is in. Accurate prediction for Pune. Its raining heavily here in Magarpatta and nearby area. Pretty heavy showers.